The first day in Kona is a story of relaxation and coffee. Having been sick for a couple of days before I left and then spent eighteen hours on planes I needed to ease back into it. Waking at 4:30am wasn’t part of that plan, but I felt rested. With so much unexpected time I went out for a gentle run along Ali’i Drive. Few were out on the roads at sunrise and it was good to get training done in the relative morning cool. I jogged along noting little seemed to have changed over the past year. Favourite restaurants and coffee shops remained with the only shock being the apparent loss of breakfast favourite Splashers. It was a great relief when I found they’d relocated next to my hotel and I can still enjoy the Meat Lover’s omelette for breakfast. 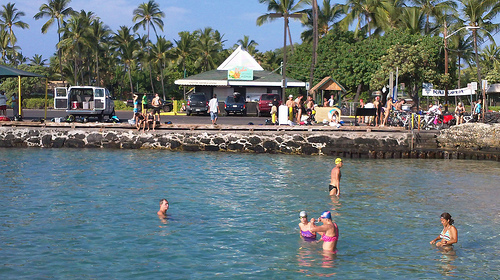 I headed to the pier for seven my first sea swim in a long while and the start of the Kona social gatherings. I don’t recollect it being quite so busy this far out from race day last year. I know it’s nothing compared to next week, but already the bag rack was full and large groups were swimming. Memories don’t do the sea justice. 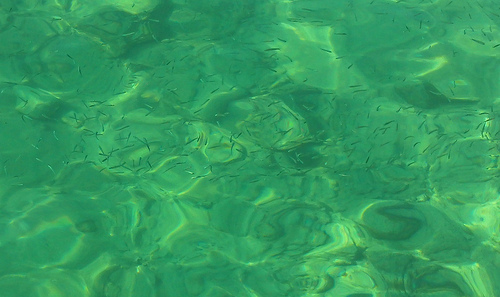 The clarity is amazing and you have to concentrate to avoid being distracted by sea life. I’ve plans to test how waterproof my video camera is out there. I didn’t really like the idea of shoving it down my speedos before heading out! I’d arranged to swim with Tim Bishop and Laura Trimble. None of us had plans or expectations of hard training so we enjoyed a leisurely swim with long intervals chatting at each buoy. From a training perspective I was pleased to feel so comfortable in the water reassuring after all the murmurs of confidence coming from pool sessions. Being obsessed with food I’d been looking forward to breakfast as much as the swim! We headed to Lava Java making the most of the remaining days before it gets busy. Once again there was no sense of urgency and we enjoyed a long breakfast. A real sense that the work had been done and all that was left was the fine tune. Temptation was there to train more I’ll admit, but ultimately the surroundings chilled me out. The rest of my day proceeded along similar lines. A few chores in the form of shopping, but carefully broken with a Cubano Latte at Kope Lani. I’d remembered how good their coffees were, but forgotten about the Cubano a slightly spiced roast that has a distinct cinnamon flavour. Just as I got back from coffee I got a call from my mate Mark to tell me he and the Biestmilch crew were in town. I turned round and headed out the door for the chance to meet a few more of the guys and to wander around town exploring the shops. It’s Mark’s first time out here and as an enthusiastic Iron Tourist I had to remind him to pace himself. There’s two whole weeks to get Kona souvenirs. Only a little training today, but a lot of walking. Better to get that done now than be on my feet next week. I kept stress levels low and was active enough to get blood flowing to the legs. Tomorrow I’ll test them out on the Queen K and see how they feel. Powermeter in hand it’s time to find out what race pace feels like on the course.